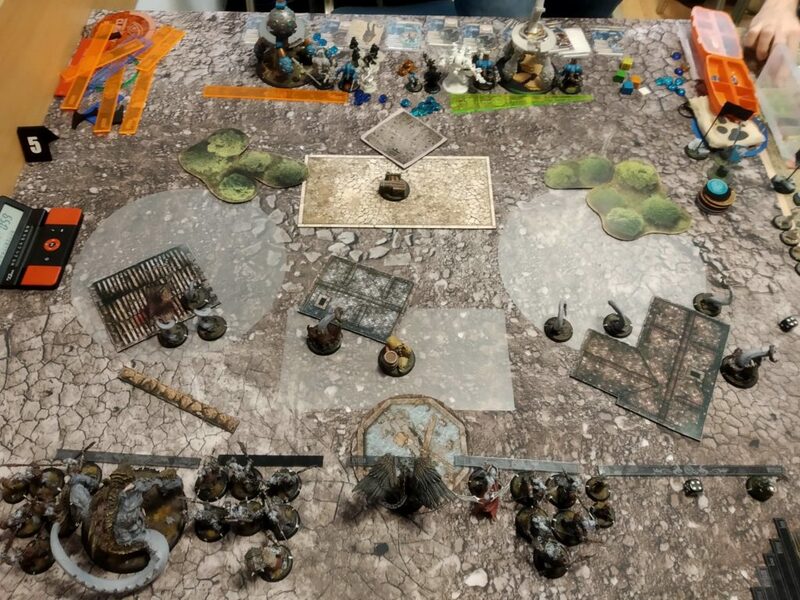 In the fourth round, the semi-finals, we faced a team from Kraków with Tomasz Mucha playing Circle, Tomasz Okólski playing Grymkin (who, by the way, I faced a month later on Kraków Masters) and Michał Góra who I already played against during our WTC bootcamp. You can find the battle report here. I decided to do the same, take the very same list I played last time. I knew it’s a favorable match up for me and I knew what mistakes to avoid. Now, that I knew how this list work, I knew better what to do. 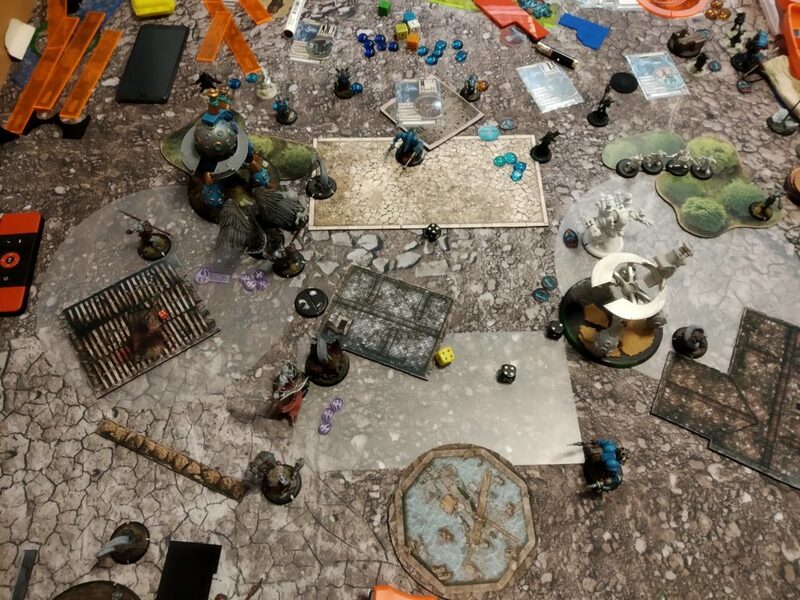 Previously we played The Pit II which is a much slower and less dynamic scenario than Standoff. That favoured my list I believe, since I could stay closer to my edge, still contesting the zones and have more space between our armies. 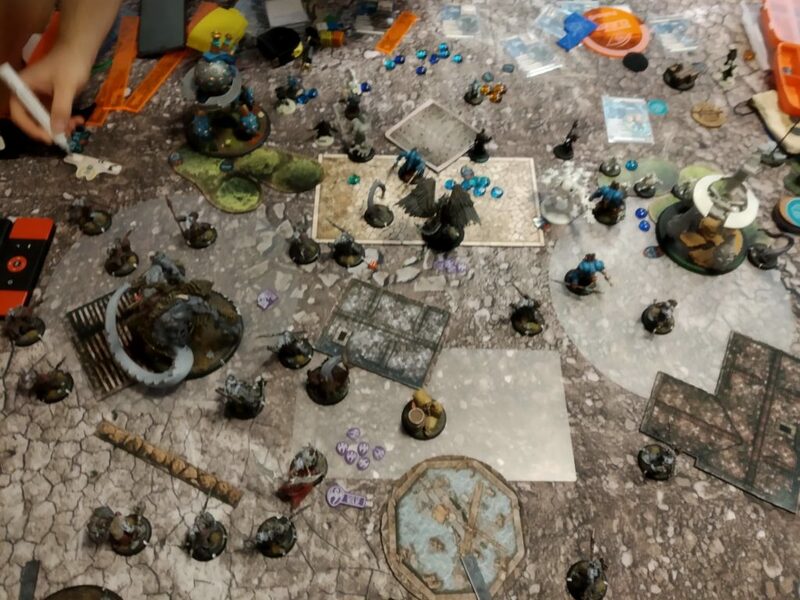 Keeping distance while playing a shooting list and not losing on scenario is essential. This scenario easily allows me to play this way. Moreover, the terrain differed from what we played on last time. There were two huge buildings on one side, preventing one of the armies to spread out. I cannot recall now who won the starting roll but I believe Michał won and chose take the side with 2 buildings, where he could put his cloud wall easier. I was to play on the side with one building only. As you can see, the photos were taken by Michał and I will be describing the directions and position of the models from his perspective. Michał deployed his collossal on the left side and the building in the middle assured me that BB will stay on that side forever. Golab was deployed in the middle part and I knew where he was heading to 😉 I expected to see the same play from Michał’s part. Threatening 11 inches from behind of the building. Most of his Warmongers were deployed on the left side, what indicated that he would probably push there and just contest on the right. He also had perfect spots for Hellmouths. I deployed my battle engines on both sides of my deployment. Nemo decided to go around of the building on the right side, next to Thunderhead (opposite to the future Golab position). Fireflies and support somewhere in between of Storm Striders. In the first round I ran everything forward, as far as I could, since Michal couldn’t do any harm apart from BB’s deviation maybe. I put AS on one BE and Electrify on the other. Nemo cast Magnetic Field and Caine0 cast Fire for Effect on Thunderhead. 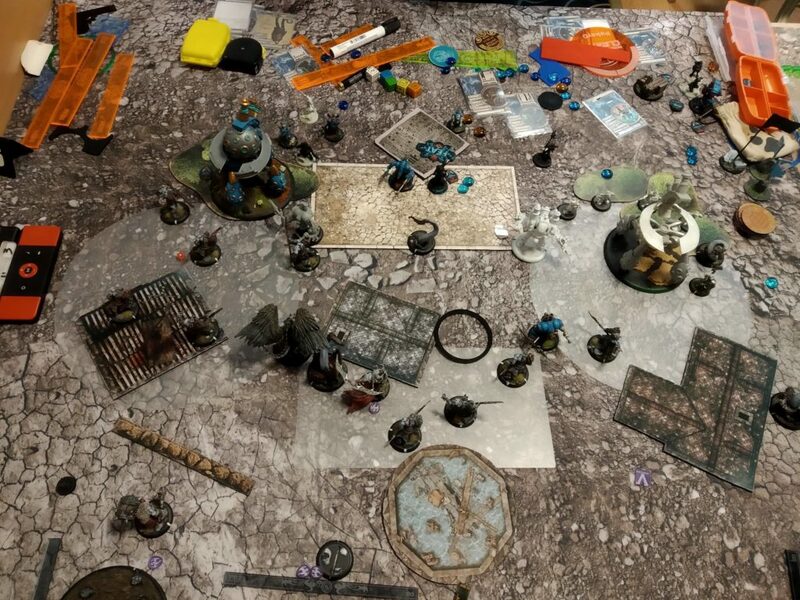 Michal executed his clever plan and put a cloud wall between the two buildings hiding his warlock behind it. He also ran one of the Warmongers forward to tempt me to shoot at him and give Vengence to the unit. Golab flew behind the building and begun to threaten 11″ from behind it. On the left flank Michał moved his forces aggressively forward and spread the +2 aura around the collossal. I decided not to feat this round and try to weaken Michał’s army before the deciding turn. I moved my left Storm Strider back and stayed outside of his melee threat ranges and shoot at Blightbringer. The other BE shot at exposed Warmonger zapping Swamp Gobbers . I managed to cripple BB’s Spirit with some hot dice. 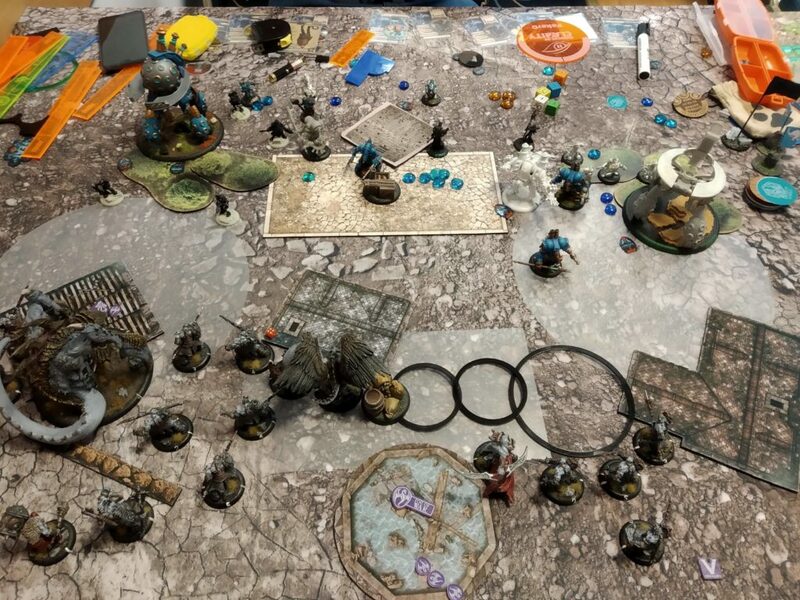 I considered pushing Thagrosh with Thunder Bolt away from Blightbrineger to leave him outside of Thag’s control range but I couldn’t find the right angle. I remembered to keep Thead 11″ away from Golab. I also kept my crucial models outside of Vengence+charge range. Magnetic field from Nemo enabled my battle group to be Hellmouth immune 😉 I had to keep Ace and Junior’s Firefly safe, though. Michał had a tough nut to crack now. 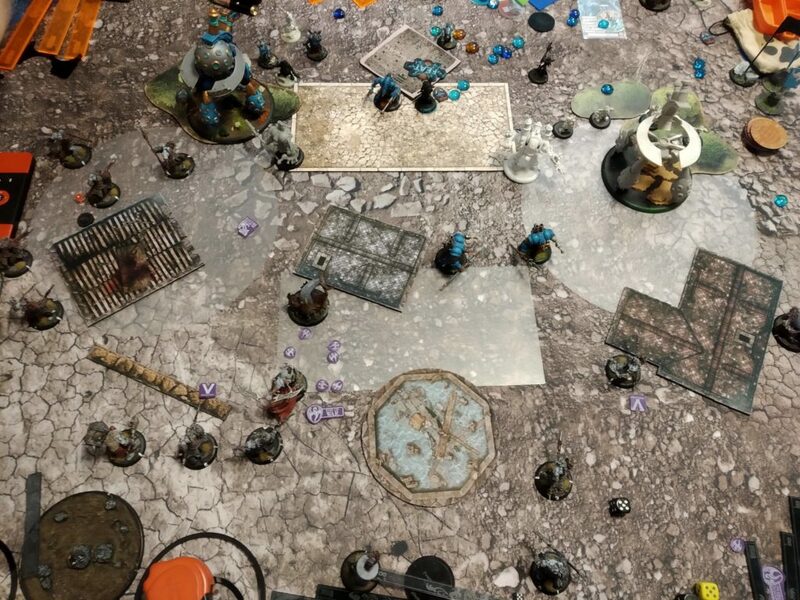 First, he dealt some damage to my objective and then Golab trampled and tried to kill it. He managed to do so with his last attack, what ment no Sprint for him this turn. Fortunately Thagrosh is able to return beasts to play with his feat. Apart from killing my objective Michał’s army was unable to significantly threaten my other models. Both battle engines and Thead were outside of any charge range. Thagrosh moved to a safer spot. Michał scored 3 points (rectangular zone, left circular zone and my objective). Michał feated Golab back. Warmongers failed to remove my second Firefly from the rectangular zone so no points there for Legion. Warmongers couldn’t break through left Storm Strider’s armor. Only one Firefly died. Still a tie, 3:3. Now I had to keep Nemo and Thead safe and everything should be fine. I focused on not wasting too much time. I cleared what I could and then flipped the clock. I scored another 2 points , 5:3 in my favour. In his last attempt, Michał charged my leftmost battle engine, but Golab failed to kill it and that was basically the game, still 5:3. I managed to kill Golab and remaining Warmongers and we finished the game. Lesson learned, this time I played much better, and what’s more important – faster, than previously. Michał took advantage of the position of the buildings and kept his Hellmouths and Golab behind it. 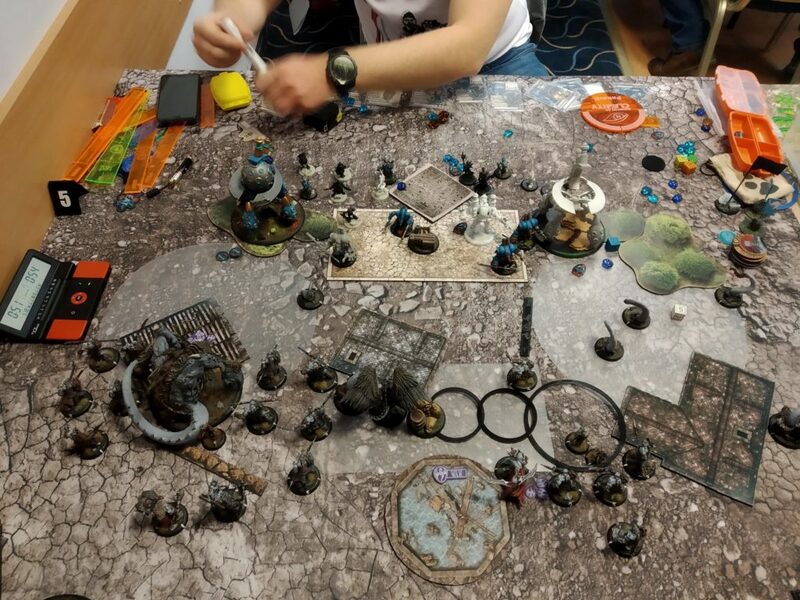 On the other hand, he couldn’t put his Blightbringer far back in the middle, so I could target him in second round without any serious retaliation. Magnetic field is a brilliant counter to any drags. I kept my battle engines and Thead far from Golab. I coulnd’t get rid of Maws, but I could kill everything else. 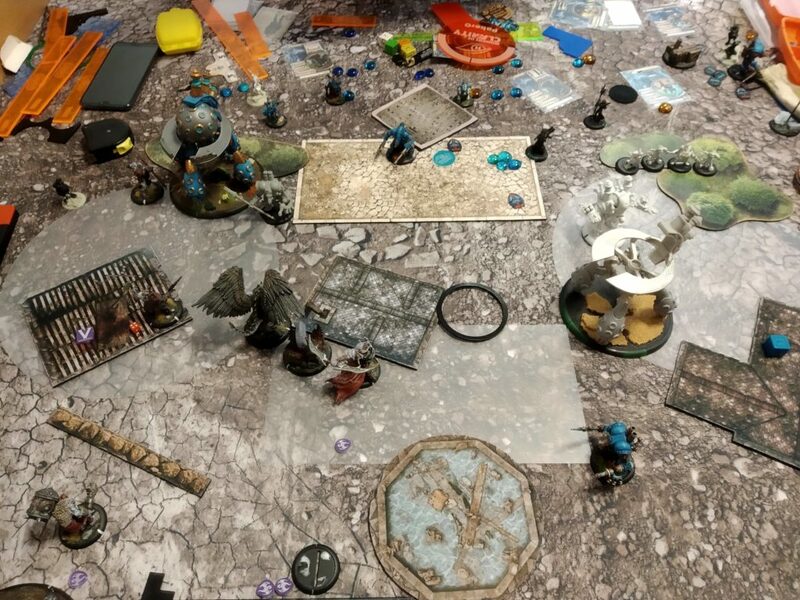 I managed to deal a significant amount of damage in my pre-feat turn what later made a huge difference. I believe that apparently going first has bought me another round of shooting. That clever cloud wall is impressive. That can be the surprise factor that the enemy doesn’t expect. I would recomend this list for Legion players that are looking for a breath of fresh air in Primal Terrors. Especially for those that do not own any Chosen 😉 and of course, Golab with two lives can really shine. To be fair, this match up is really favourable to me, I only have to play it fast enough in order not to lose on clock and try not to lose Thead in a stupid way. This way, after defeating our friends in round 4 we ended up in the final!